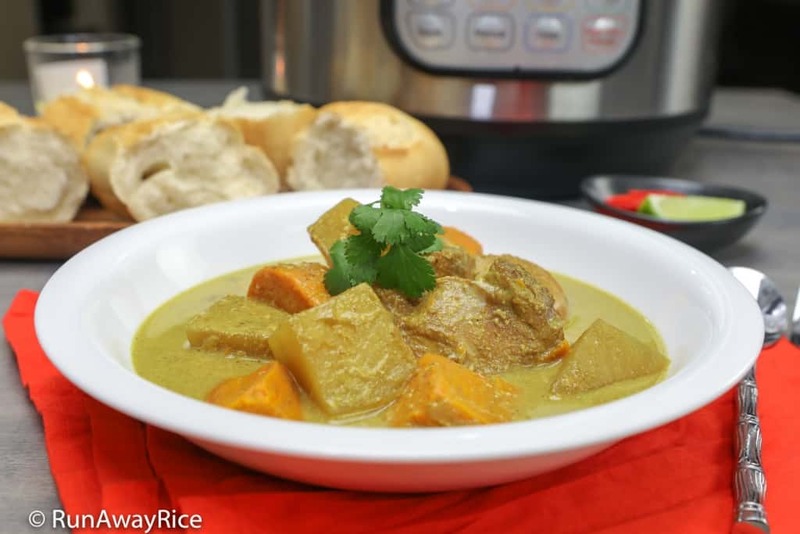 This Instant Pot Chicken Curry (Ca Ri Ga) recipe is the perfect busy day meal. 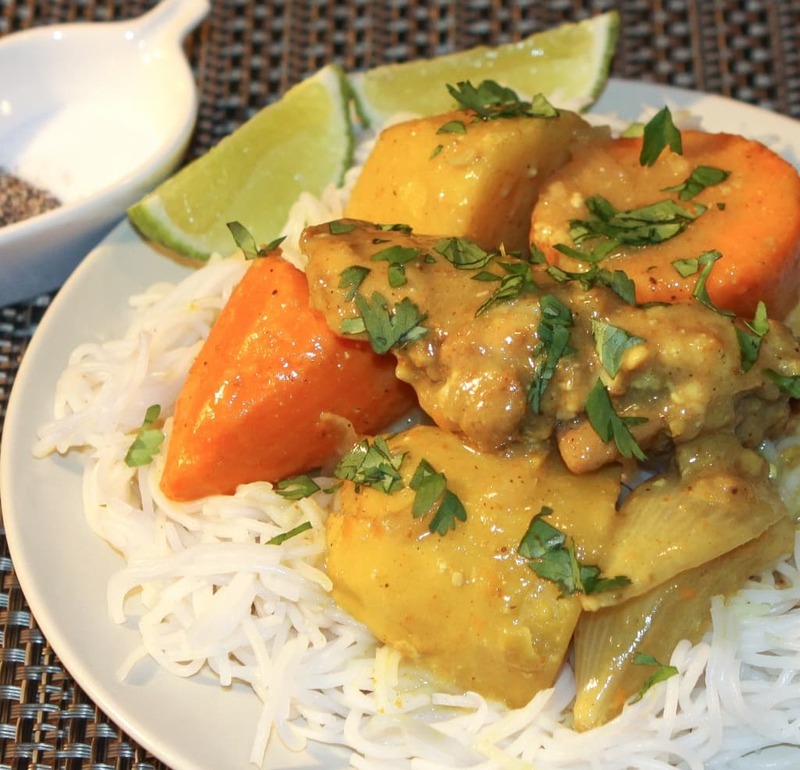 A Vietnamese-style curry, this flavorful dish features tender chicken and hearty root vegetables in a creamy sauce infused with lemongrass and aromatic spices. Sound complicated? Not at all! It’s really easy to make in the Instant Pot. 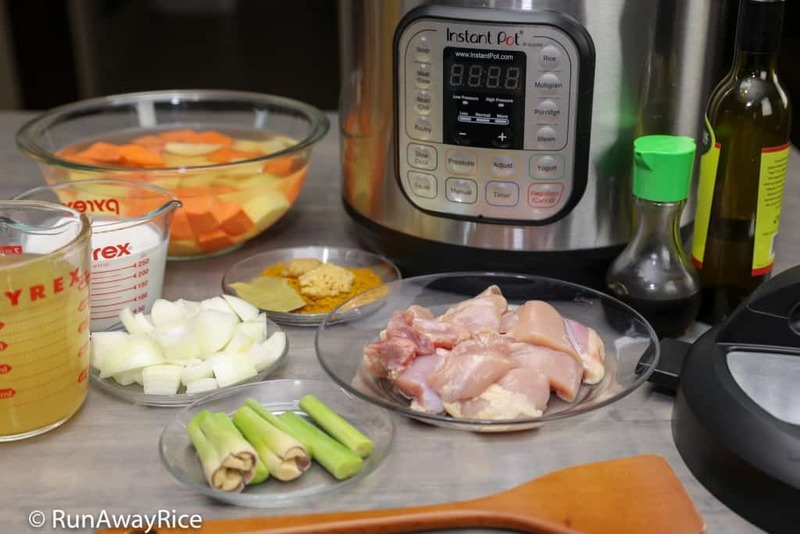 Simply prep the ingredients, quickly sauté the spices and chicken, add the remaining ingredients and let the Instant Pot do its thing. This is one pot cooking at its best! The pressure cook time is fast, just 10 minutes. While the Instant Pot is naturally releasing pressure, fluff the jasmine white rice or cut thick slabs of crusty bread and set the table. Dinner is ready! 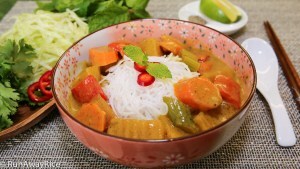 Vietnamese curry is not as rich and heavy as some curries and more on the soupy side. The generous sauce is so for dipping crusty bread and sopping up the hearty goodness. Adjust the liquid level to your preference and how you plan to enjoy it. 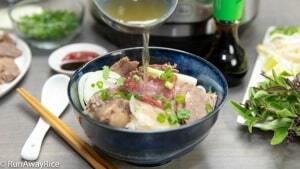 If serving over rice vermicelli like a noodle soup, you may want to double the amount of chicken stock. I am using a yellow curry powder I picked up recently from World Market. 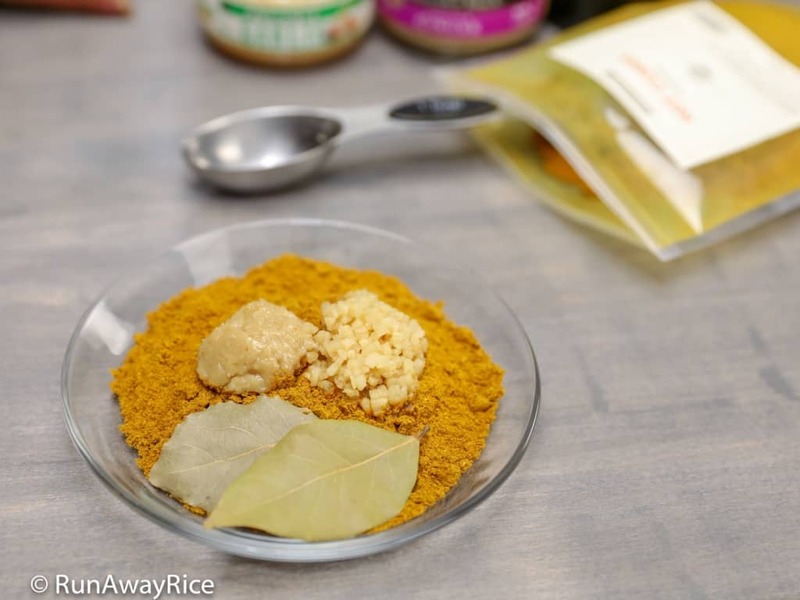 The hot curry powder is a blend of ground spices: coriander seed, cardamom seed, cumin seed, turmeric, black pepper, ginger root, cinnamon, bay leaf, nutmeg, allspice, cloves, fenugreek seed and cayenne. Feel free to use any curry spice combination you like. You can find a variety of curry mixes, as powders in packets and spice jars, and as pastes in jars and tubes. Fresh lemongrass adds wonderful aroma to curries. Bruising the lemongrass helps to release the essential oil. Be sure to remove the stalks and bay leaves from the curry before serving. The challenge with cooking everything in one pot is not all foods cook at the same time. This is the case with the potatoes and yams. I use gold or Yukon potatoes because they are firmer than Russet or Idaho potatoes and hold up really well during pressure cooking. As for the yams, they aren’t as dense as potatoes and can turn mushy when pressure cooked. To help with this, I cut the the yams into thicker pieces, twice as thick as the potatoes. This large size helps them to retain their shape and not disintegrate during pressure cooking. I am using the 8 quart Instant Pot DUO in this recipe. The recipe proportions work with the 6 quart Instant Pot as well. If you don’t have an Instant Pot but still want to enjoy this amazing dish, use this recipe and cook on the stove. Simmer all ingredients, except the yams, until the potatoes are just soft. Add the yams at the end and cook until tender. I also shared a Slow Cooker Chicken Curry recipe many moons ago so there are lots of ways to make this hearty dish. If you’re not a fan of yams or sweet potatoes, substitute with carrots. Carrots have the same density as gold potatoes so cut them about the same size as the potatoes. This Instant Pot Chicken Curry (Ca Ri Ga) recipe is the perfect busy day meal. 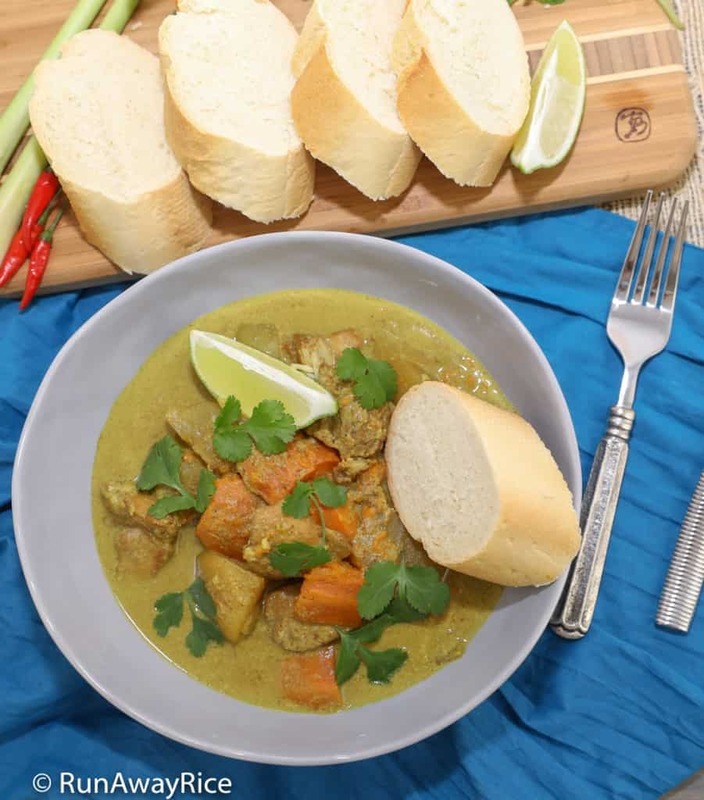 A Vietnamese-style curry, this flavorful dish features tender chicken and hearty root vegetables in a creamy sauce infused with lemongrass and aromatic spices. Sound complicated? Not at all! It's really easy to make in the Instant Pot. Simply prep the ingredients, quickly sauté the spices and chicken, add the remaining ingredients and then let the Instant Pot do its thing. This is one pot cooking at its best. The pressure cook time is fast, just 10 minutes. While the Instant Pot is naturally releasing pressure, fluff the hot white rice or cut thick slabs of crusty bread and set the table. Dinner is ready! Peel the potatoes and cut into 1 inch thick pieces. Peel the yams and cut into 1 1/2 inch thick chunks. (Yams are less dense so cut them fairly large.) Soak the vegetables in cold water to prevent browning while continuing with the next steps. Chop the sweet onion. 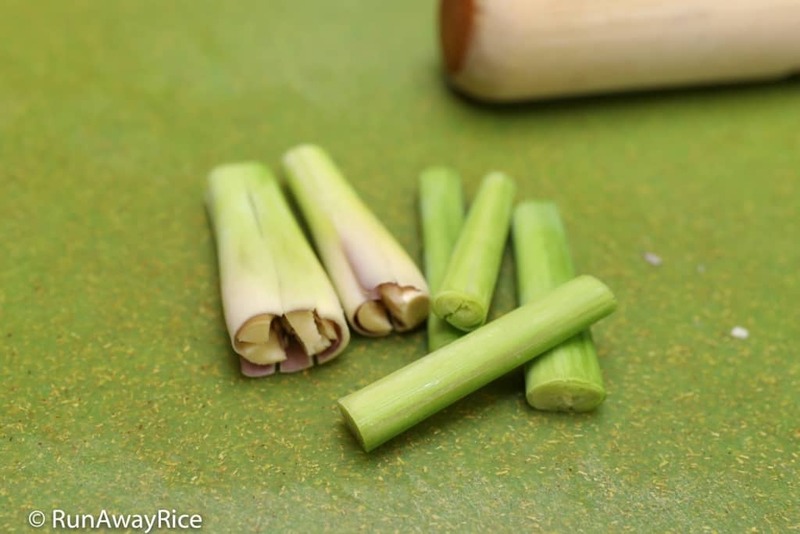 Cut the lemongrass into 3 inch sections. Bruise the stalks using a pestle. Cut the chicken thighs into large chunks. On the Instant Pot panel, press the Sauté button. When hot, add the olive oil, curry powder, garlic, ginger paste, bay leaves and water. Stir-fry the spices for 1 minute. Add the chicken and sauté for 3 minutes, coating the chicken in the spices. Drain the potatoes and yams add into the inner pot along with the onions and lemongrass. Mix together, combining well. Add the chicken stock, coconut milk and fish sauce. Combine together. Cover with the pressure cooking lid. Set the steam release handle to "Sealing". Set to cook on "High Pressure" for 10 minutes. When the cook time is completed, allow for a 10 minute natural pressure release. Release any remaining pressure. 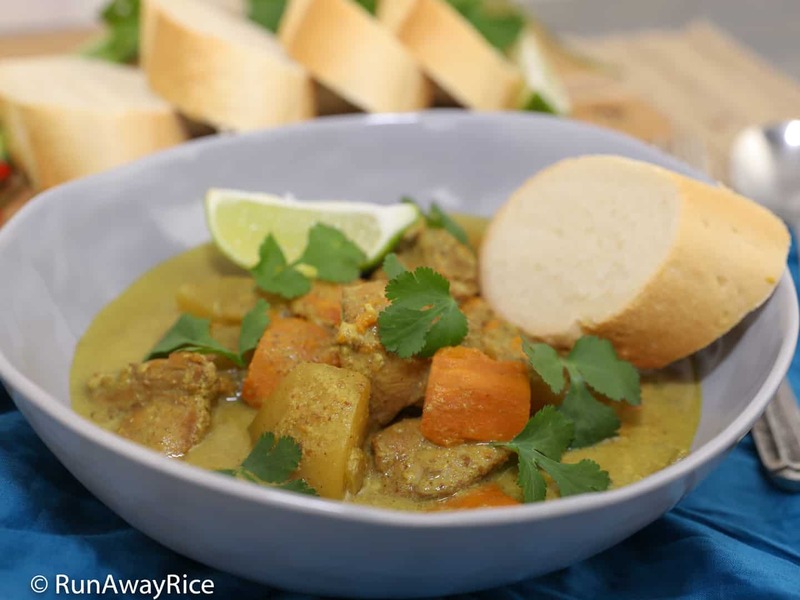 Enjoy the Instant Pot Chicken Curry over hot white rice or with crusty bread. Refrigerate any remaining portions. Enjoy within the week. 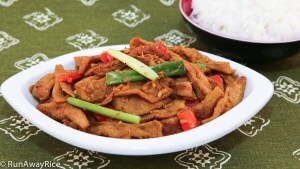 Use a curry powder or paste you enjoy. For more fiery heat, add cayenne powder. Substitute coconut milk with cow's milk for a lighter option. Optionally, reduce the coconut milk in half and substitute with more chicken stock. I am really enjoying the Instant Pot recipes you’re sharing. Your Chicken Curry recipe is a new addition to my work week menu. I do all my meal preps on Sunday and then cook throughout the week so hubby and kids have delicious home-cooked meals. I cut the yams the same size as the potatoes and they were really soft but the kiddies really liked them so I’ll just have to keep doing it this way. Thanks for an easy and awesome recipe! I am thrilled to hear you and your family enjoyed this recipe! I prep meals for the week on Sunday too especially when I know I have a busy week ahead and this an easy and delicious recipe to do just that. I appreciate you leaving a comment and sharing your results. Happy Cooking!